Burger King announced Tuesday that it plans to open several hundred new restaurants in Russia with the help of its franchise operators. The deal is another confirmation of the vitality of franchising in Russia, which has seen the number of outlets grow 30 percent in recent years. 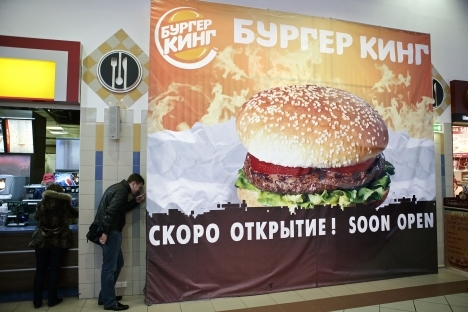 Burger King Europe, VTB Capital and Alexander Kolobov, the owner of the Shokoladnitsa chain and franchisee of 54 Burger King restaurants in Russia, agreed on a deal that would make them co-shareholders in the restaurant's franchise, said Tim Demchenko, head of private equity and special situations at VTB Capital. The investment bank would act as a partner rather than a creditor. It plans to invest up to $100 million in the first five years of the deal in an effort to increase the number of franchised Burger King restaurants in Russia to over 300, Demchenko said. "As a whole, this segment of the market looks good, Burger King particularly, but other franchises as well," Demchenko said. "Russian buyers have a good perception of brands and respond well to quality products." Though this is the first such mega-deal for franchising here, many participants in the segment remain concerned about the lack of financing options available to potential partners. "In the West, businesses are divided into 'franchise' and 'nonfranchise' categories. Banks understand that their risk levels are different, but in Russia this hasn't happened yet," Rostislav Ordovsky-Tanayevsky-Blanco, founder and chairman of Rosinter, told The Moscow Times. Rosinter, which franchised KFC and TGI Friday's in Russia, was selected by McDonald's Russia in April to be its first franchise partner, setting up in transport hubs around the country. McDonald's is currently not considering recruiting other franchisees in Russia, the company's representative said. It is still more common for a new entrepreneur to borrow money from friends and co-investors than from a bank, said Yekaterina Soyak, general director of Exhibition Management Group, which promotes franchising in the country. Banks usually put franchises in the same category with small and medium-sized businesses, Soyak said. These businesses are considered the most risky, so perspective franchisees get hit with higher lending rates, 10 percent or more. The situation is different in the West, where banks recognize that franchises are using tested business models and give them better deals for start-ups. Sberbank is currently the only major bank with a credit program that targets potential franchisees. The bank developed its Business-Start program in collaboration with the Russian Franchise Association and launched a test version in November. The program finances up to 80 percent of an investment for projects that involve one of the bank's 13 accredited franchisors, with a maximum credit line of 3 million rubles. The lending rates are still high, 17.5 to 18.5 percent, but applicants don't need to provide collateral. "This is the first victory and the first special product for our business model," said Merab Elashvili, president of the Russian Franchise Association. But Sberbank's program has not taken off as expected. Six months after launching Business-Start, Sberbank expanded it to 57 cities. It received 500 applications, but only four were granted credit. Two hundred applicants stepped away from the program, and the remaining applicants are still negotiating the terms of their partnership, said Maksim Svetovtsev, the program's leader. Franchisors say that there is a chasm between those whom Sberbank classifies to be ideal borrowers and those whom the franchisors want to see as their partners. The bank is looking for people ages 20 to 60 who don't already own a business, Svetovtsev said. "This is the paradox: If an experienced franchisee wants to open a second, third and so on, store, he will be denied credit. But these repeat openings have the most reliable track record. These facts show the best in the franchisor as well as his junior partners," Soyak said. Svetovtsev said established business owners could turn to other Sberbank programs for support. "The first pancake always comes out wrong, but at least it's here. We are pouring the mix onto the pan," Svetovtsev said. Experts expected other banks to follow the trend when Sberbank launched Business-Start, but that has not happened. The Russian Franchisee Association is helping FundServiceBank and Promsvyazbank develop products for franchising, Elashvili said. The association has also received offers to work with VTB, BCC Moscow, Svyaznoy and Otrkitie banks. "We believe that we can convince the banks to lower their lending rates for franchising, as it is a less risky form of business," Elashvili said. "We also see the prospects for unsecured loans. The franchised store, just like a car, can serve as collateral." Ordovsky-Tanayevsky-Blanco is optimistic that better financing programs will help franchises gain a firm foothold in Russia. "It would be a big plus if there was financing," he said. "We are still in the very early stages. I think banks will get a handle on this matter in the next five years." First published in The Moscow Times.